From today (April 30) the maximum costs of making and receiving calls, sending text messages and downloading data when travelling abroad within the EU has been reduced. 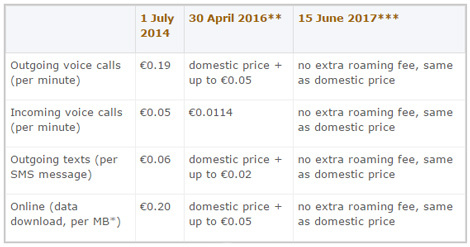 As the table below shows, the maximum cost of making a call has been reduced from €0.19 per minute, to the individual’s network domestic price plus up to €0.05 per minute. And the charge for downloading data has been reduced from €0.20 per MB, to the domestic price plus €0.05 per MB. Member States’ national telecoms regulators must ensure that mobile phone operators comply with the new rules. Note these are the maximum charges – operators are free to offer lower rates. UK operator Three, for instance, does not charge roaming in 18 countries worldwide, including EU countries France, Italy, Spain, Austria, Denmark, Finland, Ireland and Sweden. 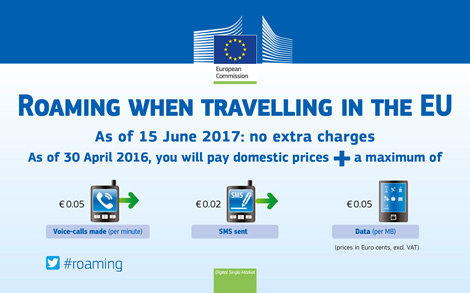 Roaming fees when travelling within the EU will be abolished entirely from June 15, 2017.